ASIC/FPGA Bayer CFA Interpolation IP Core for image/video processing and applications. 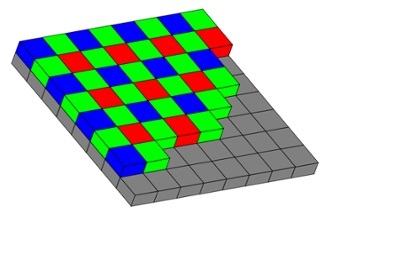 A Bayer filter mosaic (shown below – image by Wikepedia) is a color filter array (CFA) for arranging RGB color filters on a square grid of photosensors. Its particular arrangement of color filters is used in most single-chip digital image sensorsused in digital cameras, camcorders, and scanners to create a color image. The filter pattern is 50% green, 25% red and 25% blue, hence is also called RGBG. MRA Digital’s Bayer CFA interpolation IP Core utilizes a robust technique for demosaicing of color images produced by CMOS and CCD image sensors. Our algorithm implementation utilizes a linear filter leads to an improvement in PSNR of over 4.5 dB when compared to bilinear demosaicing, and about 0.7 dB improvement in R and B interpolation. The proposed filter also outperforms most nonlinear demosaicing algorithms, without the artifacts due to nonlinear processing, and a much reduced computational complexity.